Busy with some more hares, these two are watercolour. From life by any chance? I’ve not often seen hares. No I am not that good, but I live in a very rural area, and also have a friend who is a photographer, ( his photos are much better than mine, especially for the movement shots or close up heads) even my blurred photos are ok ish to paint from at times, I would love a great photo of a couple of hares boxing, but never seen that yet, maybe one day, it’s all about the right time and place I guess. Near me is cranborne chase in Dorset. Or next closest, but better place is oxford….I only visit here with my photographer friend. Sometimes I can go to a site, and see nothing! So photos are important to use all year round. I have found the more I paint them, the less I stick to the actual photo while painting, and sometimes take bits from a couple of photos, especially for face only paintings. 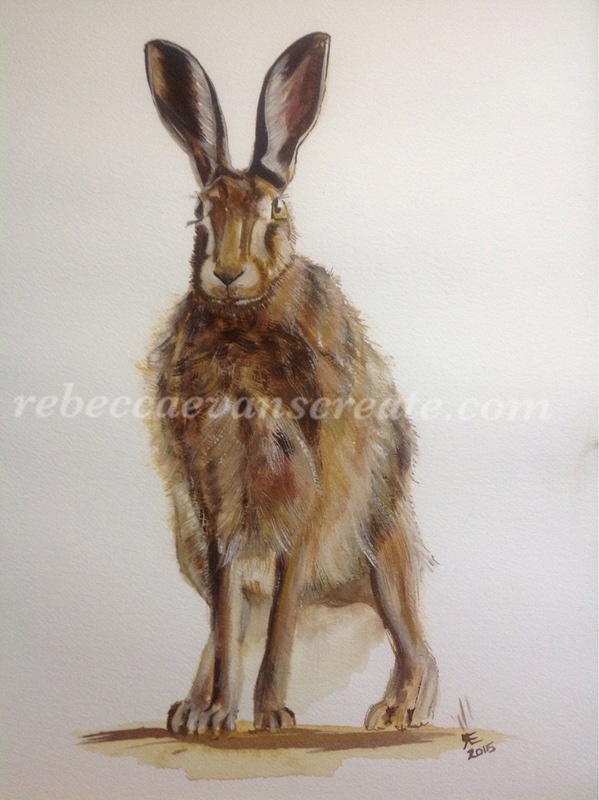 I just love experimenting, hares have become my fav, followed by horses and dogs. You get a beautiful sense of movement and textures. On reflection it would be astounding to do these finished pieces from life. I meant do you get the chance to watch and do rough sketches of them to supplement the photos? I don’t know if that’s even feasible (the old pun “hare one minute gone the next” crosses my mind). It would be great to be able to do so. It would be great, I have never tried, mainly because I am more intent on capturing the hares when they appear. The saying in my experience is quite right. I live in the new forest, and we have some great places to photograph deer, I have many great shots, but I can’t get into painting them. It’s all about that feeling you get when you paint. Maybe I will try and sit painting the deer at the deer platform ……I just have never tried, some of it is time, I am a late night painter, and spend most free time riding on my ponies in the new forest. Your paintings and sketches are amazing, managing to visit a variety of sites, your mind must be buzzing with ideas? I love your use of the mesh. I have just bought some crystal paint from SAA, called brusho, I think it will be fun to try, especially for nature art, I am always trying to create more movement/ life into my paintings and I think this will add an edge to it?? I need to try hares soon! I could become hare-crazy if I stayed in here too long lol. Probably for me at this point would be colored pencil. Or black ink. Or ink and wash maybe. I dont think I’m ready for full-on watercolor yet. I think this is a terrific subject for it tho. 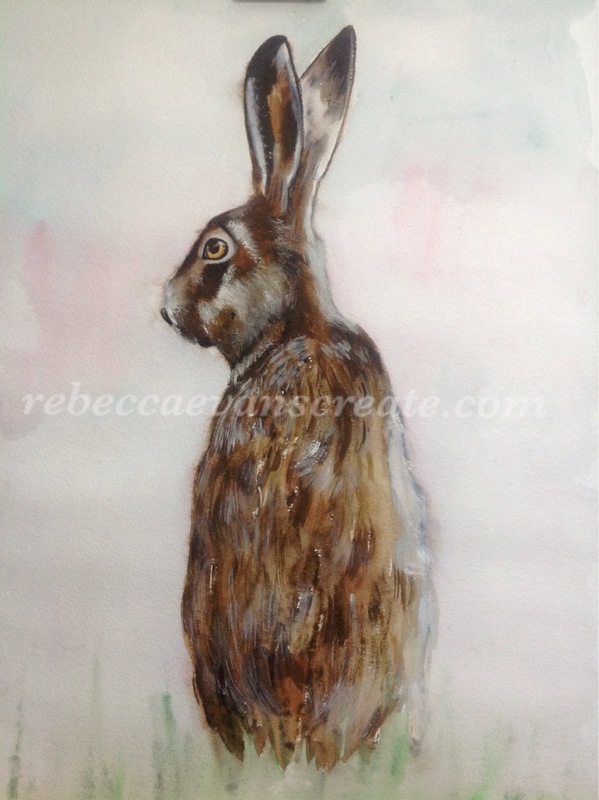 I think you could get hooked on the hare, every one I love to paint, and they work well with lots of medium…. I am just in the process of an experimental hare, I have done some test pieces with my concoction!! Now to see if it works with the hare? It’s only in my head at the moment. They do work well with ink…plus ink is still my fav to work with ( all colours of ink) have fun, they are easier than cats for sure!